After 25 years as a butcher, I’ve tested, used, sharpened and thrown away many boning knives. If I had to choose my favorite, I’d recommend you the Wusthof Classic Boning Knife without thinking twice: it’s easy to sharpen and maintain, and performs extremely well with literally any kind of meat. This knife will last you a lifetime. I’ve been a professional butcher for over 25 years and I have personally owned and been through a plethora of different boning knives. The purpose of this article is to show you how to choose the right boning knife for your needs, and also show you my personal favorites. Fish, meat and poultry contain bones that are often unwanted. While some meat cuts keep the bone intact, many prefer to remove the bone. Not only does this make making stews, fillets and food more edible, it also allows for a safer time eating. Now that you know what to look for in a boning knife, let’s take a look at my two favorite boning knives. These knives have a permanent place in my utensil draw and have helped me remove bones from a variety of cuts, including chicken and fish among many others. One of the most prized knife manufacturers in the world. Wusthof provides what they call the classic boning knife. Flexible and spanning 6 inches in length, this knife is, in my opinion, the best boning knife on the market today. I like that the blade of this knife is very narrow. When piercing a cut, you’ll see that a tiny slit is made that does not degrade the quality of the meat at all. 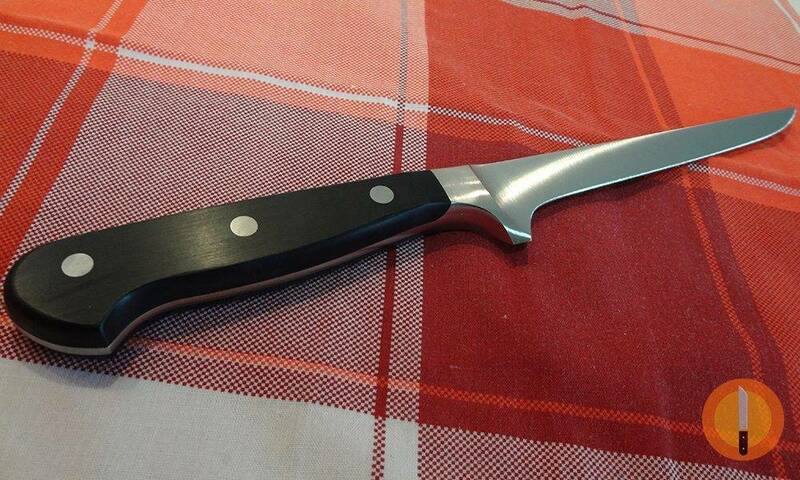 Ideal for poultry, this knife is also a great choice for fish. Smaller, less dense cuts of beef and pork will also suffice. However, the manufacturer has classified the classic as best for poultry. Being full tang, the blade goes through the handle and is secured by three rivets. When pressing down on the handle, you’ll quickly notice the amount of control that is provided. There is a slight curvature seen that allows for an overall better grip. Between the blade and handle, there is a small gap of metal leading to a slip feature that ensures that even if your hand slips you won’t hit the blade. When piercing into poultry, you’ll notice that the tip of the knife is extremely sharp albeit thin enough to remove any bone with ease. It is the perfect balance between precision and usability. Backed by a lifetime guarantee, the manufacturer will replace this blade if it ever breaks. I have not had to replace my knife personally, so I can’t comment on the return and replacement process. Measuring 12.5 inches in total length, you can put the classic in the dishwasher or quickly clean it with soap and water. This is a knife that you can add to your will and pass down to a family member; that is how long these knives last. While more expensive than most other boning knives, owning a Wusthof is an investment that will last a lifetime. For the ultimate in quality and precision, this is my favorite knife for deboning poultry. 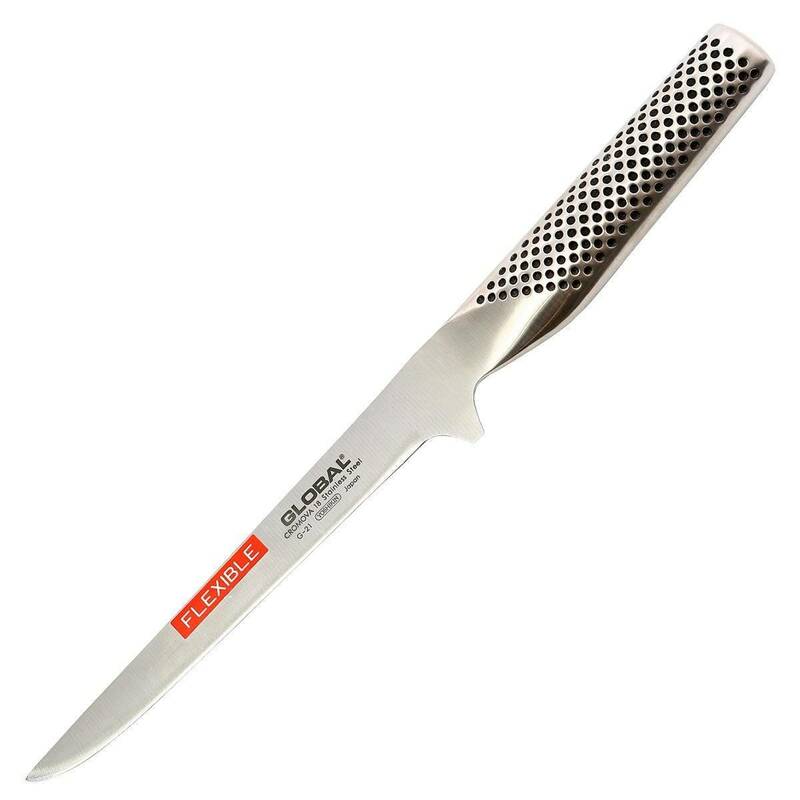 If you asked me what knife compared to the Wusthof Classic, the Global G-21 would be my choice. This knife has an amazing look and makes removing bones as simple as possible. With a slightly longer blade than our previous knife (measuring 6 ¼ inches), I find myself interchanging these knives often. The one standout feature about this Japanese-made blade is that it is an all-purpose option. Deer, pork, chicken and fish can all have their bone quickly removed with this blade. 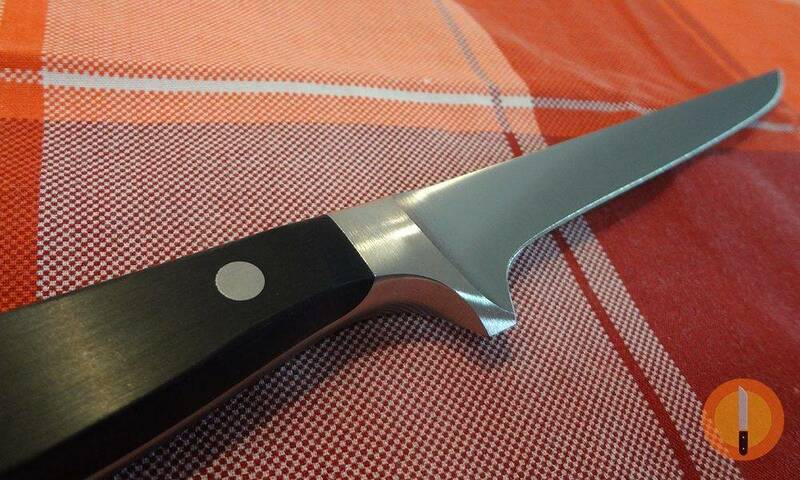 One of the biggest benefits of this knife is that the handle of the knife is forged of stainless steel. This allows you to put as much force on the blade without worrying about it breaking where the handle and blade meet. The grip is exceptional. While most stainless steel provides minor traction at best, there are dimples crafted into the handle providing exceptional traction. As you move down the handle, you’ll also notice a protruding piece of stainless steel that has been slightly rounded. This is put in place to ensure that if your hand does slip when deboning, you won’t accidently hit the razor sharp blade and cause injury. The blade immediately thins out at this point. Extremely sharp, you’ll easily see the blades bevel. When I pierce meat, I am always cautious of my hand placement. With this knife, I go to extremes. One wrong slip and the blade will slice right through your finger; it is that sharp. Flexible, yet slightly stiff, this light blade weighs under a pound in weight and has been classified as flexible. Upon using this knife, I noticed that while flexible, it is a little stiffer than other flex knives. Not only have I used this model on fish and chicken, but I have used it on deer and pork as well. For an all-purpose knife, this gets my highest recommendations. One note that I must make is that this model is not dishwasher safe. I wash mine with soap and water before immediately drying it after each use. It’s very rare that I find a knife that can do it all. If I had just one knife to choose to do it all, the G-21 gets my seal of approval. Technically, you can remove the bones from most cuts with a regular knife, but this is both dangerous and wastes much of the meat in the process. Not manufactured for the purpose, a regular knife is thicker and does not provide the same level of flexibility that some cuts need. The thin blade of these knives make the de-boning process faster. Less meat is wasted during the de-boning process, leaving the cut intact. Removing bones is far easier when the proper knife is used. There are really two main categories of meat that you’ll come across when cooking: thick and tender. Thick: With a thicker skin and tougher meat, these cuts require a stiff knife that is sharp and thin. When removing the bone, you need to maintain a high level of precision. If the wrong knife is used, a slip can cause a massive injury or ruin the cut. Tender: Before cooking, tender cuts are easy to enter with a knife. These are your poultry and fish cuts. Especially with fish, you need to have a delicate hand and a thin blade that is able to cut out the bone with relative ease. 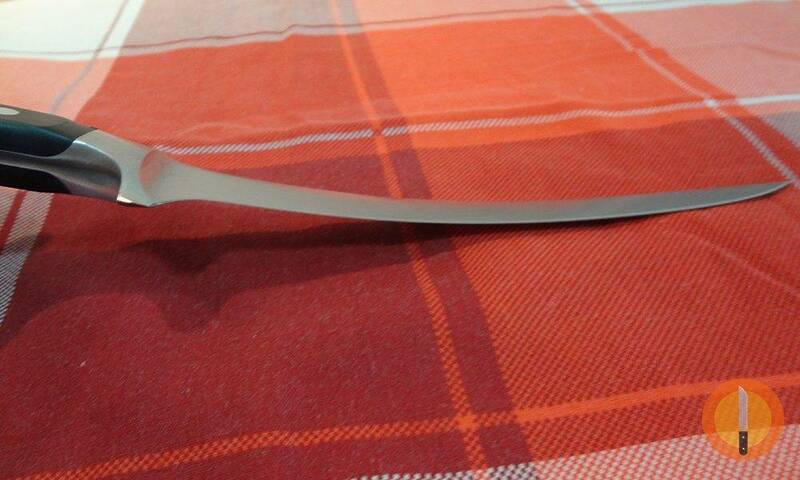 Curved boning knives are made especially for fish and will be able to remove most bones with just one pass. The biggest and most prevalent benefit to using a boning knife is that you’ll save an immense amount of time. If you choose to use a different knife or a fillet knife, you risk injury and can ultimately damage your knife in the process. If you’re an advanced cook, you’ll often find yourself using a boning knife to fillet some cuts. With a thinner blade, a boning knife can be used when trying to fillet certain items. Is it ideal? No, but it will get the job done if you don’t have a fillet knife handy. This is a little added bonus for anyone that doesn’t fillet meats often, but may find themselves without a proper knife to do the job when the time arises. Choosing a knife to buy is a very tedious process. I have found that there is a lot more to the process than merely buying a best seller or choosing a knife based on aesthetics. Knowing exactly what features and specifications to consider has allowed me to buy exceptional knives that are often priced well below the competition. 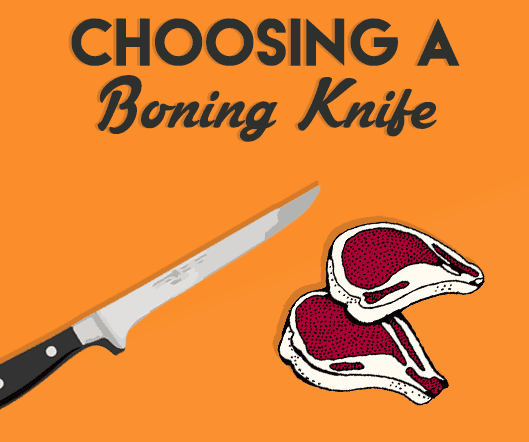 If you’ve never purchased a boning knife before, keep reading. The flexibility is the most important aspect of a knife. Why? Because if a flexible knife goes into a thicker cut, it will often break or bend. Alternatively, if a stiff knife is used on fish, you’ll have a much harder time removing all of the bones. Stiff: Needed for thicker cuts. Very little flexibility is seen with these knives. Flexible: Normally smaller in size. These knives provide great flexibility and control. 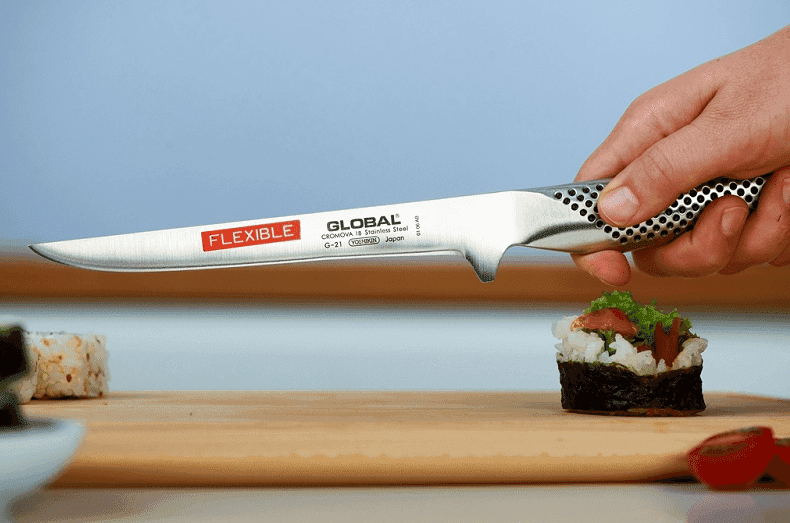 If your main goal is to remove bones from fish or poultry, you’ll need a flexible knife. Otherwise, you’ll need a stiff knife. The average blade will span from 5 to 6.5 inches. The smaller the blade, the more flexibility will be seen. There is no one-size-fits-all option here, but you’ll want to choose a smaller blade if you’re removing bone from delicate cuts. Personally, I choose to have a smaller and larger blade available at all times. Even with fish, I often need to use a stiffer blade, especially for saltwater fish. A few manufacturers are offering blades in the size range of 7 – 9 inches, but these are more of a specialty item that would be needed for extremely large cuts of meat. If you’re using your knife as a professional butcher, this is just one more useful tool that will make your job easier. You put all of your force through the handle of a knife. There are a variety of handle types available from wood to hard plastic. The choice of which handle works best for you is all about preference and looks. With synthetic materials, such as Polypropylene, there are coatings applied that enhance the user’s grip. I love wood handles for their look, but wood can rot if left in water and doesn’t provide the same level of resistance or grip. Another thing to consider is the tang of the blade. There will be blades that are either full tang or partial tang. Full tang means that the metal needed to craft the blade goes all the way through the handle. This provides a more durable product and further control. Partial tang blades are fine, but they can break where the handle and blade meet. Some blades are straight, and some are curved. While the novice may not know the difference between the two, this design can mean the difference between spending 5 minutes and spending 20 minutes removing bone. With a curved blade, you’ll be able to remove the bones from a fish in just one pass with the knife. If you use a straight blade, the process becomes more intricate and difficult to complete. It would be very difficult to find a blade that has not been forged with stainless steel. As a buyer, you’ll notice various forms of stainless steel available. Cold steel, tempered, 4116 and high carbon are among the most popular. The best part is that all of these materials will suffice. High carbon blades are often lighter in weight. Cold steel blades are more durable, but all of the blade types will provide enough durability and sharpness to allow you to debone any cuts you wish. Stainless steel is also stain and rust resistant, which is a nice added bonus. High-end knives and lower-end knives will be scattered among your search. It may be tempting to buy some of the cheaper knives on the market, but you’re truly sacrificing your cuts in this case. While more expensive, higher-end knives are often more precise and come with a very sturdy, steel design that will allow for years of use without fear of the item breaking.